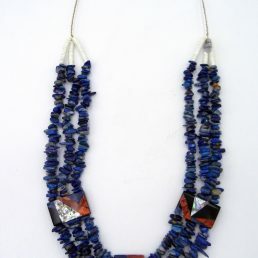 The Native American Navajo squash blossom necklace, while a Native American creation, developed slowly and is deeply rooted in non-Native American Indian culture and history. 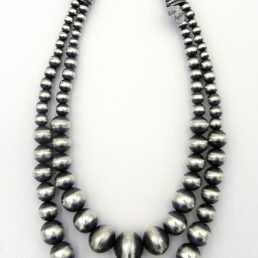 The main part of any squash (blossom) necklace, the crescent shaped pendant called the “naja,” was used as an iron adornment on horse bridles of the Spanish Conquisatdors in the late 1500s and early 1600s. Southwestern Native American peoples, upon seeing these iron ornaments, slowly began to acquire these pieces, predominantly through trade, and soon graced the necks of the local populace. These pendants, originally brought from Spain, reflected the influence of earlier Moorish conquests and the occupation of Spain. 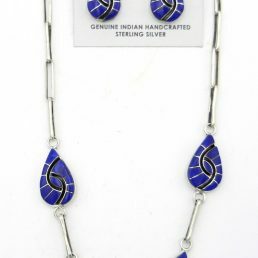 The piece can also be traced even further back in time to an ancient object used to ward off the evil eye. Over time, and with each generation, the naja became more and more symbolic with various ceremonials. As most ceremonials were related to the agricultural cycle, the naja became associated with crop fertility. 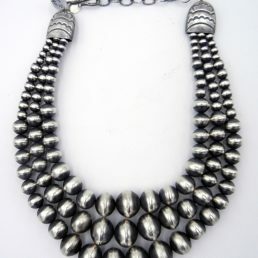 Once silver beads came into fashion around 1880, it followed that they became the logical place to display this now prominent symbol. 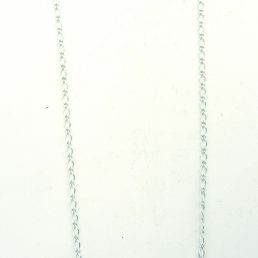 The necklace we now call the Navajo squash blossom necklace, though, most likely did not originate much before 1880, although the exact date is not known. 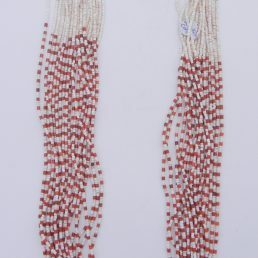 Initially, Navajo and Zuni beads were Spanish-Mexican trouser and jacket ornaments fashioned to resemble the pomegranate/pomegranate flower, a common Spanish décor motif. It followed that early Navajo “squash blossom” beads show a striking similarity to the Mexican ornament and the pomegranate. 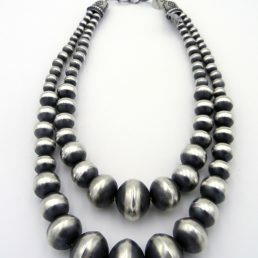 There is, however, doubt that Navajo silversmiths attempted to depict this blossom in their beads. 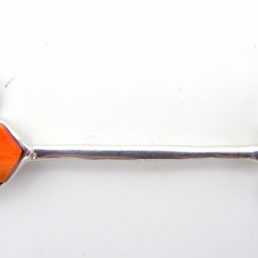 The Navajo word for the squash blossom bead is “yo ne maze disyagi,” which means simply “bead that spreads out” and does not relate at all to squash or pomegranate blossoms. 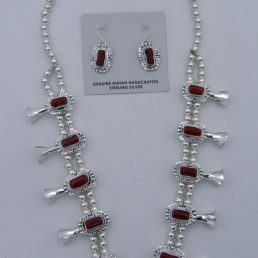 It is doubtful, therefore, that the Navajo intended that the bead represent a squash blossom. Nonetheless, all have tended to portray the necklace in a crop-fertility light, likely because the pieces were used so often in ceremonials dealing with the agricultural cycle. In addition, the beads and chain looked like pomegranates or squash blossoms, whether or not that particular aspect was intentional. 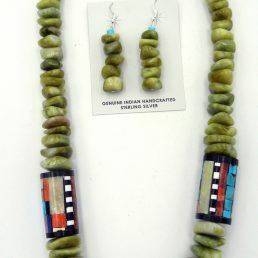 The Navajo squash blossom necklace serves as a reminder of the close interaction between the Pueblo and Navajo Native Americans beginning in the 1800s. 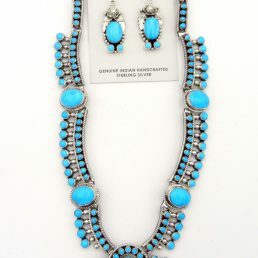 The necklace itself is Navajo, eventually adopted by the Zuni Pueblo, however, the Zuni were the first to incorporate turquoise into their creations, which became a method adopted by the Navajo. Unfortunately, for such a symbolic piece of cultural significance, there is little historical documentation on the subject. 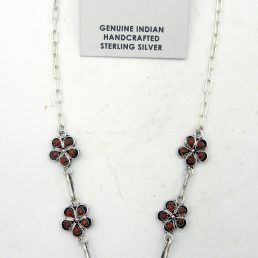 Visit Palms Trading Company if you’re looking for Navajo Squash Blossom necklaces!